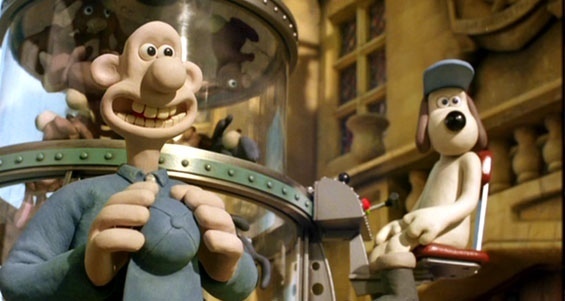 I have to admit that I wasn’t exactly foaming at the mouth over a Wallace and Gromit movie. Sure, I’d enjoyed Nick Park’s previous three short films featuring the simple Yorkshireman and his much-smarter canine pal. But could the formula really stretch to feature-length without seeming protracted and overwhelmingly twee? As much as I love the Pixar movies, it’s nice to see an animated movie with its own unique style – and there’s no mistaking Aardman’s particular brand of animation for any other studio. Colourful, and with a wonderful attention to detail, there’s something inherently endearing about the facial expressions of the model cast from Wallace’s Martin Clunes-chic ears and mile-wide grin to Lady Tottingham’s clownish rosy red lips. And of course there’s Gromit’s wonderful army of expressions that say more than words could – annoyance, determination, fear, bravery…Give that dog an Oscar (or at least a bone). The movie helps sustains its running length by throwing in a great reserve of supporting characters with a few ‘name’ voices in operation – Peter Kay’s PC Mackintosh, Ralph Fiennes’ smarmy toff Victor Quartermaine, Helena Bonham Carter’s posh, good-natured Lady Tottingham (the focus for both Wallace’s and Quartermaine’s affections) and Nicholas Smith show-stealing Reverend Hedges. Then there’s Peter Sallis, whose soft, genial tones perfectly capture the essential spirit of Wallace as he affably sleepwalks through everyday life. There is something uniquely British about Park and co’s work, and from Creature Comforts to The Wrong Trousers their main strength lies in the ability to satirise (though never maliciously) the idiosyncrasies of English life. This satire is played to the hilt here, but it’s also mixed in with an affectionate spoof of 1930s Hammer Horror movies along with several inventive and very funny set-pieces that could rival any Hollywood blockbuster. My personal favourite has to be Gromit and Quartermaine’s canine battling it out upon a runaway fairground plane (until the coins run out), but the movie is full of similarly great moments that keep the movie rattling along at a furious pace. And if the film does feature an overload of groan-worthy puns (particularly anything cheese-related – ‘From Brie to Eternity’, ‘East of Edam’ etc etc), then this is all part of the everyday humour of the simple, good-natured Wallace – and the movie’s packed with enough bona-fide hilarious jokes (like the vicar pouring over the ‘Nun Wrestling’ magazine) to keep old and young viewers amused alike. Surprisingly then The Curse of the Were-rabbit is an unqualified success. Park’s last movie, Chicken Run (which he co-directed with Peter Lord), was amusing enough if a little insubstantial, but here he hits upon what has to be one of the best family movies of 2005. And somebody, please please, give the vicar his own spin-off movie – maybe with a dash of ‘Nun Wrestling’ thrown in for good measure.